In early January, Barbara and Victor drove to Adelaide along the coastal route. We enjoyed the magnificent scenery along the Great Ocean Road in Victoria, stopping for lunch at Lorne, then we visited Apollo Bay, Port Campbell, Loch Ard Gorge, Port Fairy and Warnambool. There we dined at a fabulous restaurant overlooking the harbour and ocean, then we stayed overnight. On day 2 we explored tower hill, an enormous ancient volcanic crater, with lakes, forests and lots of wildlife. We saw koala bears and emus close up. We visited Portland, an industrial city with a magnificent deep-water harbour. We crossed the South Australian border at Nelson, where the pretty Glenelg river meets the sea. We visited Beachport and Robe, then stayed at Millicent overnight. We then drove alongside the Coorong, and crossed this salt-lake at a dry crossing to see the ocean beach at 42-mile crossing. We then drove on via Lake Albert and Lake Alexandrina, Murray Bridge to One Tree Hill, where we stayed with Kim, Russel Samantha and Alexander. We spent time also with Daniel Tracey and Austin in Craigmore, and with Angela, James, Paul, Melissa and Cameron in Angaston. We drove home by a direct route to Geelong, after a pleasant 9 day holiday. Our 2002 summer was one of the coolest on record, with only 5 days over 30 degrees Celsius. We only managed to use our boogie boards twice at the surf beach at Ocean Grove! On the positive side, we've had more rain, our garden is greener, and there is still a little water in our dam at the beginning of March, which is unusual. During January and February, Barbara's daughter Roslyn spent some time with us at Green Arches. Barbara and Victor enjoyed many walks around our local and beautiful Bellarine peninsula, and a few bike rides as well. We visited the Geelong Highland Gathering, where we saw Scottish dancing, hundreds of bagpipe bands, and tossing the caber. We renovated our bathroom, with a sparkling new spa bath! Autumn started in March, with a lot more warm days than summer, including two spells of 2 days over 30! We went for a great cycle ride along the banks of the river Barwon in Geelong, and a fabulous walk in the Ottways above Lorne. Barbara's son Daniel, with Tracey and Austin, spent Easter with us in Drysdale, and even in April it was warm enough for all of us to swim in the sea at Ocean Grove. We also all enjoyed a meal out in Geelong with Victor's daughter, Karen and Lee. 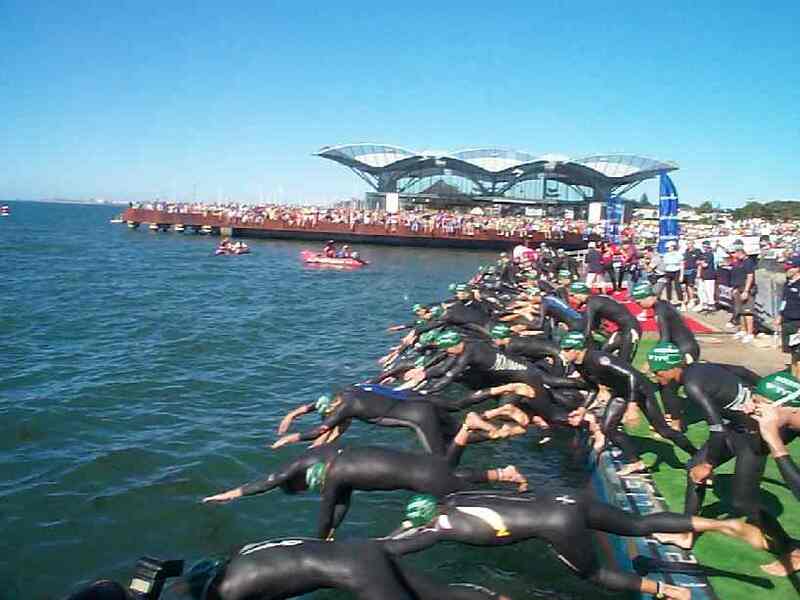 One day, while Daniel and Tracey were in Melbourne at the footy, Barbara and Victor went into Geelong with Austin, where we saw the international triathlon event on Geelong's waterfront. Then half way through April, Barbara's daughter Angela came over with Melissa, Paul and Cameron for a week with us. The children were in the pool every day, even though the weather had started to cool somewhat! One week later, over the long ANZAC weekend, Barbara and Victor stayed in the Grampians National Park, with Kim, Russell, Samantha and Alexander. We enjoyed walks and car tours around the mountains, waterfalls and forests in this beautiful region of Victoria. We continued to have warm weather till mid-May, then winter seemed to start with a bang! We have had our wood fire alight constantly since then! But it hasn't rained much in our Bellarine Peninsula, so the water level in our dam is very low. In June we bought a brand new bicycle each, and we have enjoyed more comfortable cycling since then. It gave Victor great pleasure to dump the old bikes at the tip! In Spring, we visited Ballarat, an old gold-mining city North-West of Geelong, in the Great Dividing range. The daffodils and spring flowers were lovely in the Botanic gardens, but while we bravely walked all round lak e Wendouree, the wind across the lake was fierce and icy-cold. In October, we visited the National Rhododendron Gardens, in the Dandenong Ranges. Here the parks is filled with masses of Azaleas, Camellias and Rhododendrons, in a magnificent hillside setting. We have been active in state politics, by supporting the Liberal Party, and attending many functions. Victor created a web site for the Liberal Candidate for Bellarine. The state election was on 30th November, and sadly from our point of view, the Labor party won against the Liberals, by a large margin. Our candidate campaigned very well on mainly local issues, but his vote was swamped by a state trend towards Labor. Despite our natural disappointment at this result, and our concerns for the future of Victoria under Labor, we genuinely believe in democracy, and acknowledge how lucky we are to live in the free and peace-loving country which Australia is. In November we installed a solar hot water system on our North-facing roof, so from now on nearly all our hot water should be as free as sunlight! We have also planted more trees at the rear of our property, and are trying to keep all our older trees alive by careful watering, in accordance with the current voluntary water restrictions. Geelong's water reserves are currently at 70% of capacity, but the forecast is for a long, hot, dry summer. In early October, Karen and Lee erected a large shed behind our shed, in which they have stored all their furniture. They have left their Melbourne jobs and rented house, and moved up to Queensland again, where Lee is working on a contract to thatch the rooves of George Harrison's property on Hamilton Island. In late October we took the northern route to Adelaide. We drove up to Swan Hill in Victoria, on the river Murray, and visited the pioneer settlement. We stayed at a comfortable resort motel where we took advantage of a fabulous indoor heated pool. We then drove west following the river Murray, to Mildura, and on across the South Australian border to Renmark. The weather was extremely hot and dry here, and we saw in the distance, swirly dust storms, which we found out later, caused thousands of tons of the best soil to be lifted up and dumped out at sea east of the Australian coast. Renmark is a beautiful city on the River Murray, and the central reserves of the main streets are all filled with glorious beds of roses, which were all in full bloom. We continued following the course of the Murray River to Swan Reach, then headed west to Angaston, in the Barossa Valley. 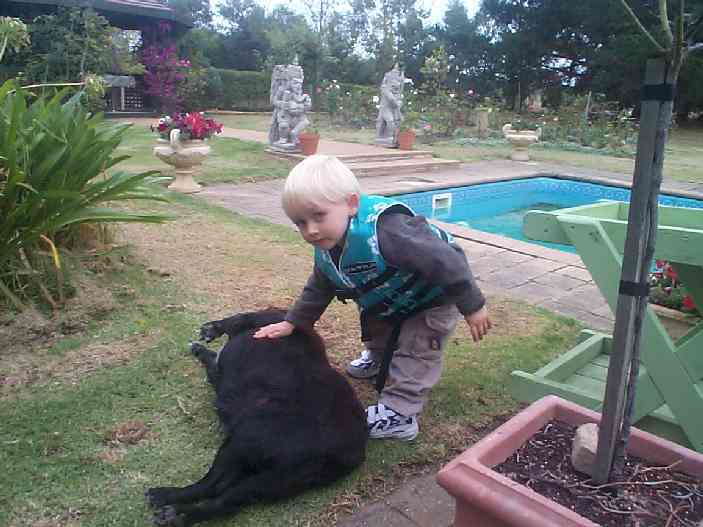 On arrival in the Barossa Valley and Adelaide, we visited Barbara's family. 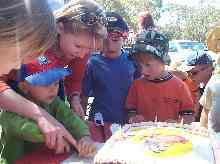 The highlight of this visit was Austin's 4th Birthday Party, (Barbara's grandson) which took place at a National Park in the Adelaide Hills. On Monday 23rd December, two of Barbara's children's families arrived here in Drysdale, then on Christmas Eve, the third group flew in from Adelaide. In all we had 12 people staying with us for a week or more, and 16 or 17 on Christmas Day. So we are all enjoyed a fun-filled large family gathering over the Christmas-New Year week.